« Què és un doctorat? 23 April 2010.- These two Envisat images over the North Sea illustrate the absence of aircraft over Europe following the ban on air travel enforced due to safety concerns over volcanic ash plumes billowing from the recent eruption in Iceland. The first image, acquired on 21 March 2009, captures numerous aircraft condensation trails, or ‘contrails’, while the second image, acquired on 20 April 2010, shows a contrail-free airspace. Although the formation of contrails depends largely on weather conditions, it was very obvious over Europe (even from the ground) that there were very little contrails visible during the six-day shutdown. Exhaust emissions from jet aircraft contain large amounts of water vapour, which, under certain atmospheric states, will condense to form ice crystals. These act as condensation nuclei around which even more water vapour in the surrounding air condenses. The end result is the formation of an elongated cloud-like condensation trail in the sky. 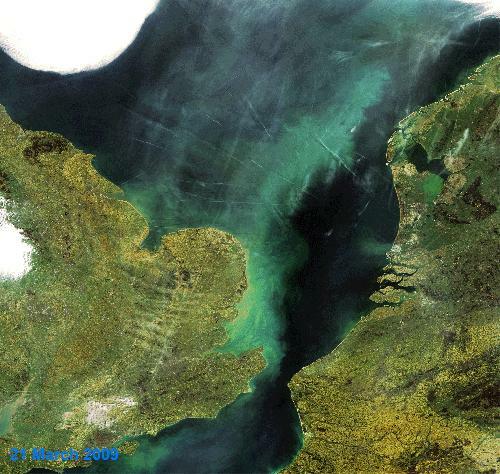 Also visible in the image are portions of the Netherlands (upper right), Belgium (lower right) and England (left). The various colours of green visible in the sea are due to sediments transported in the water. The images were acquired by Envisat’s Medium Resolution Imaging Spectrometer (MERIS) instrument, working in Full Resolution mode to provide a spatial resolution of 300 m.
Some creative minds are benefitting from the air trraffic restrictions in the most enterprising ways. Ireland’s largest bookmaker, Paddy Power, just launched a brand new website, VolcanoBetting.com. Paddy Power’s home base of Ireland has been among the hardest hit by flight cancellations. Paddy Power had been offering odds of various volcanoes erupting on its website prior to launching the new venture. They were also offering odds on when Eyjafjallajökull would finally stop erupting. This feature contains also information released by ESA. This entry was posted on 24 Agost 2010 a 12:23	and is filed under 1. Ciència. You can follow any responses to this entry through the RSS 2.0 feed. You can leave a response, o trackback from your own site.